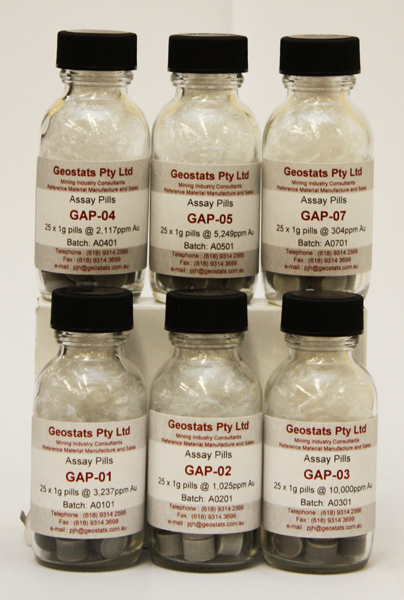 In September of 2010, Geostats Pty Ltd, in association with Assay Solutions Pty Ltd, began producing Assay Pills. These are used in the gold industry for monitoring a laboratory's preparation and analytical accuracy. Assay Solutions prepared these pills and named them 'HARM' and then a 2 digit code. Geostats have renamed them to 'GAP' and a two digit code to be more consistent with other products. These pills are available in glass jars containing 25 x 1g pills. 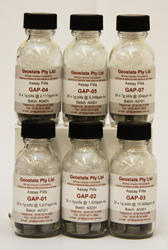 Assay pill grades that we have manufactured before are tabulated below and current stock levels are indicated. If you require a different grade, please contact us to discuss.